Legend has it that before going to battle, King Arthur would gather with his knights around a round table, the shape of which prevented any of the king’s barons from claiming authority over another. The round table also provided a sense of purpose, fellowship and belonging to an entity that was larger than the sum of its pieces. Fast forward almost a millennia and it could be said that modern businesses have the same goal for their employees (well, minus the whole riding off on Biblical crusades part): To have stakes in a venture that is both meaningful and larger than yourself. How can a company apply Arthurian legends to their offices? Well, let’s do what King Arthur did and start with that conference room table, the place where decision makers, stakeholders and innovators gather to share ideas and information and plan for the future. Your round table doesn’t even necessarily have to be round, either (psychologists have found that there are ways to create so-called power seats at a table no matter what shape it is). Other options include rectangular, racetrack, boat-shaped, U-shaped, figure eight or a custom shape. It definitely doesn’t have to be made of wood as Arthur’s might have been; it could be glass, stone, laminate or, heck, even made of LEGO (see below!). No matter what shape it is or what material it’s made of, the table should be the right fit for your business and its goals. 1. Include: One of the most important functions of a conference table is to offer a seat for everyone attending a meeting. That said, when shopping for one, you need to make sure it’s big enough to fit the number of people who will be using it regularly, while also fitting in the room proportionally. When everyone has a seat at the table, the feelings of inclusion and being part of the team will result in more inventive thinking and problem-solving and better overall office morale then if people are left standing on the outskirts. 2. Comfort: Meetings can be tedious and long, so you want to make sure that those in attendance are comfortable. The right conference room for your business will not only be large enough to accommodate large groups, but also give each person a little breathing room. There are some basic recommendations when it comes to how much space each person needs. At minimum, the space is the width of the chair around the table (anywhere 24″ to 30″ wide). Of course, as anyone who has ever sat in a coach on an airplane knows, this isn’t a lot of space and isn’t very comfortable. Ideally, each person has 36″ of space at the table, and up to 42″ for meetings where attendees need more space (to spread out paperwork, laptops, etc.). To figure out what size table you need, simply estimate the maximum amount of people that will regularly sit at the table and multiply that by the amount of space you want to provide each of them. The right conference table is both practical and inspirational. 3. Inform: Office furniture does more than just provide places for people to accomplish tasks. It can also offer clients, job recruits, investors and other visitors insight into the type of company you are. For instance, an open office filled with casual meeting spaces and bright pops of color might indicate a more creative, carefree work environment compared with a law office that opts for closed offices, muted colors and traditional wood furniture. This concept is especially important for your conference room, which is often the site of important meetings with decision makers and customers. Selecting an attractive table that speaks to your company’s aesthetic will give people a peek at your business’ story. In addition, the shape of the table also serves a function. Oblong tables with definitive heads where meeting leaders, managers or executives sit tell people who’s in charge, whereas round, square or octagonal tables offer a more democratic and informal vibe. 4. Integrate: It’s rare to have a meeting these days that doesn’t have some digital presence, whether colleagues are taking notes on their iPads or the sales manager is sharing a PowerPoint presentation. A conference room should not only serve as a place for people to set down their various devices, but also as place where those devices can be powered and other AV equipment can be docked readily. This will free up the floor of hazardous and messy-looking cables and wires and allow the meeting to proceed seamlessly. 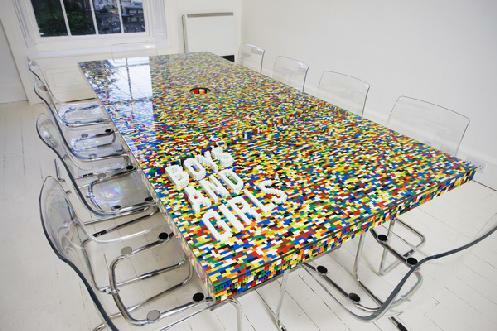 This conference table made of LEGO shows that this company isn’t afraid to try something new. 5. Inspire: The design of the table not only tells people a little bit about your company, but truly unique, beautiful or innovative tables can also inspire or energize the people sitting around the table. Take this table made out of Legos, or this one with swings for chairs or this one that uses bicycle wheels for legs. Do you think your gray-laminate-topped table will get your employees thinking in new and creative ways the same way these outside-of-the-box designs would? Start shopping for the perfect table for your business at Arnolds Office Furniture.